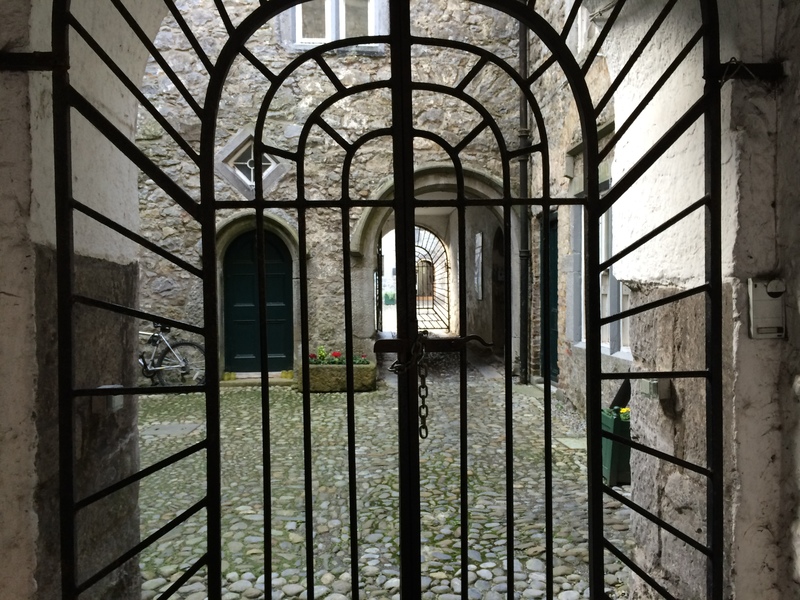 Postcards from Kilkenny, a medieval wonderland. 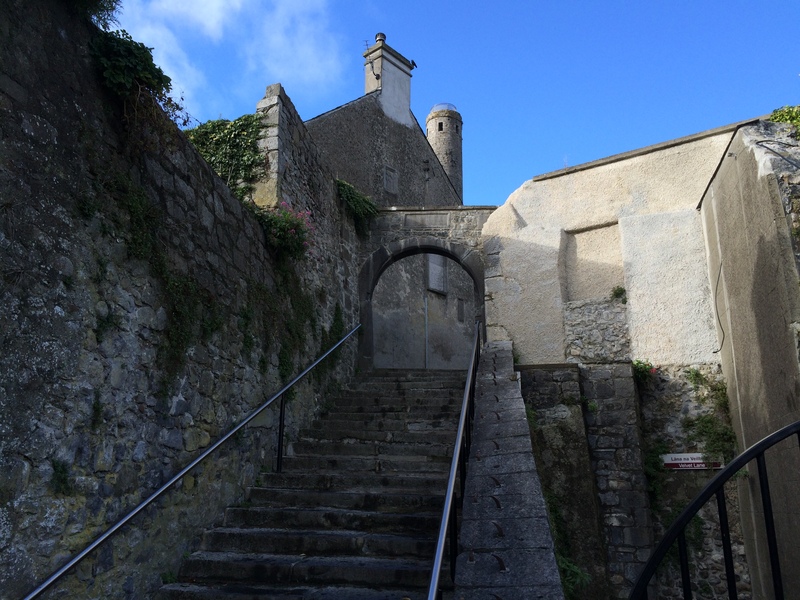 I’d long wanted to explore the famous historic heritage here and was thrilled to explore and finally learn a bit more about Ireland’s best preserved medieval city. Here are some pictures. Below: the thick colonnaded columns and arches of the arcade of the same front exterior. Below, another view and angle of the same courtyard, thus time looking left and upwards to this gorgeous balcony/ loggia. At this stage, I felt as though I was in Verona! Above: The upper stories here, (above) are the Kllkenny Court House. It was built in the early-modern period by the great Irish architect and Surveyor-General, Sir William Robinson, with its clearly neo-classical columns, pediment and so on. Robinson, as surveyor general 1670-1700, is a major figure in Irish built history. He’s responsible the Charles Fort in Kinsale, Co Cork and- in my own home stomping ground Dublin- for much of the Upper yard of Dublin Castle, for Marsh’s Library, and the Royal Hospital at Kilmanham. 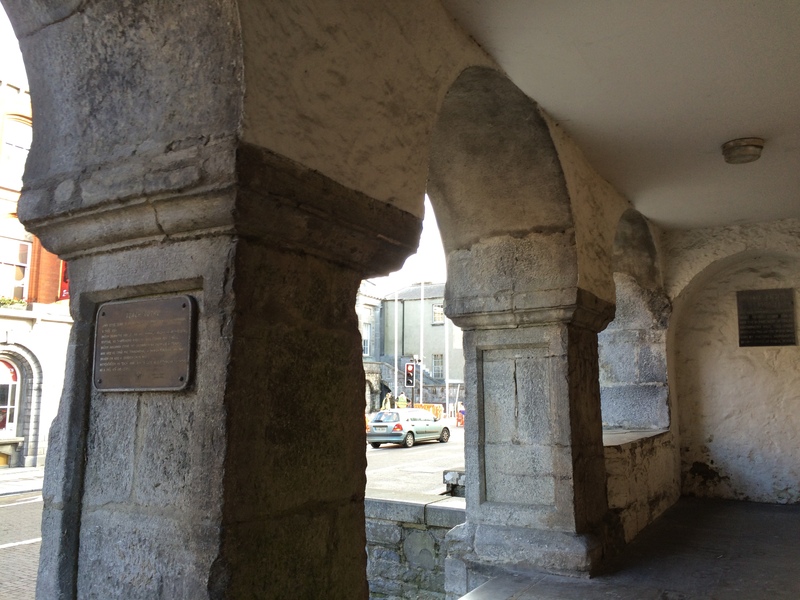 But now look again, at the lower floors underneath the Kilkenny courthouse above. I visited the exterior here twice last weekend, but it wasn’t until my second visit Saturday morning, with the excellent guide and local historian Pat Tynan I fully appreciated the complexity of the building. 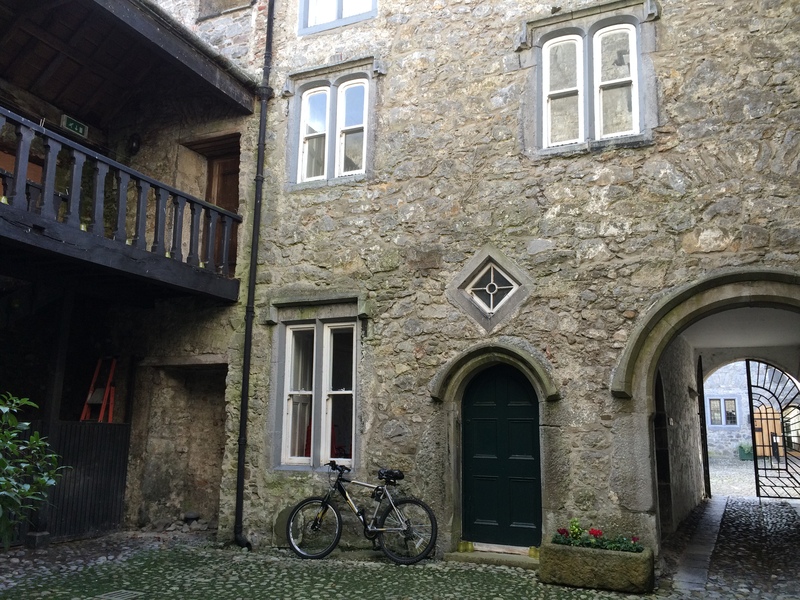 These lower sections, below Robinson’s lovely courthouse, were the City prison, but also, previously the remains and lower sections of Grace’s Castle, a medieval stronghold, belonging to the powerful local family of that name. 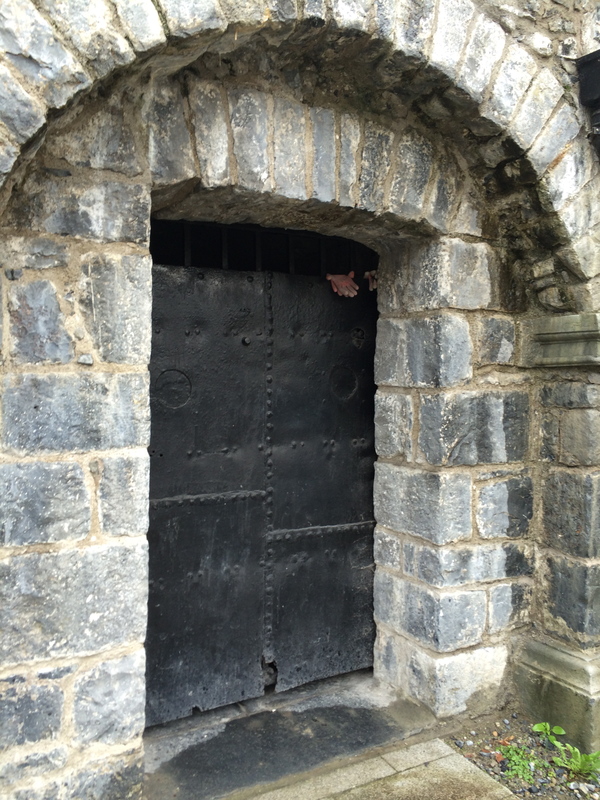 These rooms then became cells of Kilkenny’s prison, underneath the court house. 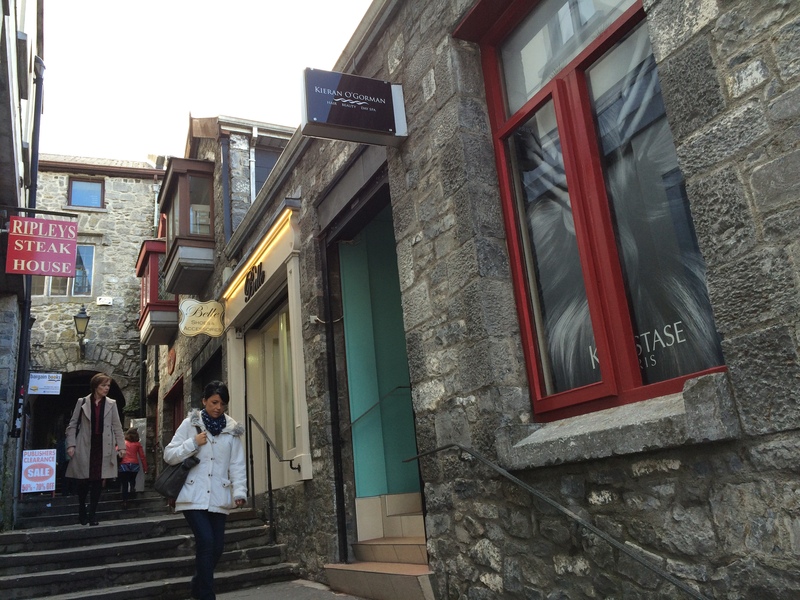 It’s a wonderful example of the way very old buildings are frequently mixed and “layered” in their history. I don’t much like the look of these cells. According to Pat, a typical sentence for stealing a loaf of bread was about 4 years! Before we leave the old courthouse/ prison, can’t resist showing you these workman’s gloves, hanging over an old cell door! (above and below) They could have been left here by accident. But I doubt it. Looks like a clear example of black Kilkenny humour to me! 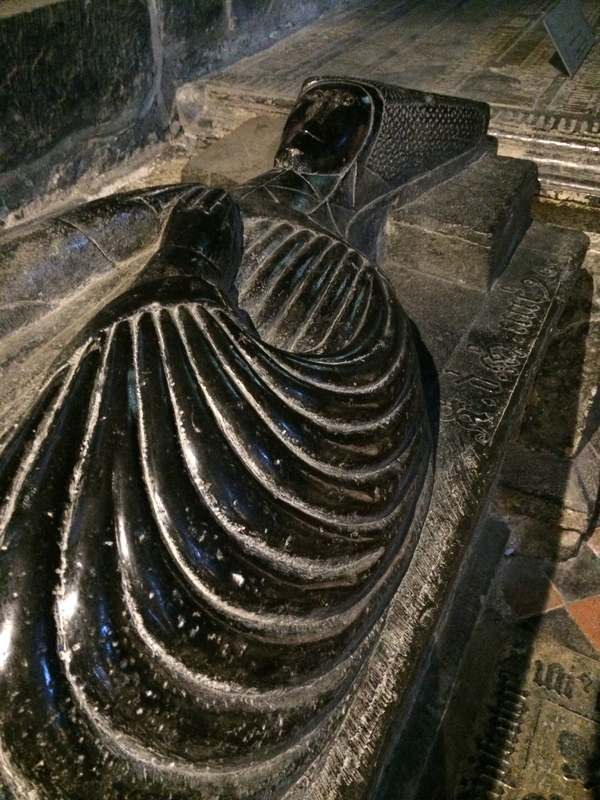 By the way, when we get to the Kilkenny’s stunning St Canice cathedral in a forthcoming post, you’ll meet the Grace family again, via two of their stunning black marble medieval tombs. Here’s a sneak preview below, the tomb of Honoria Grace. 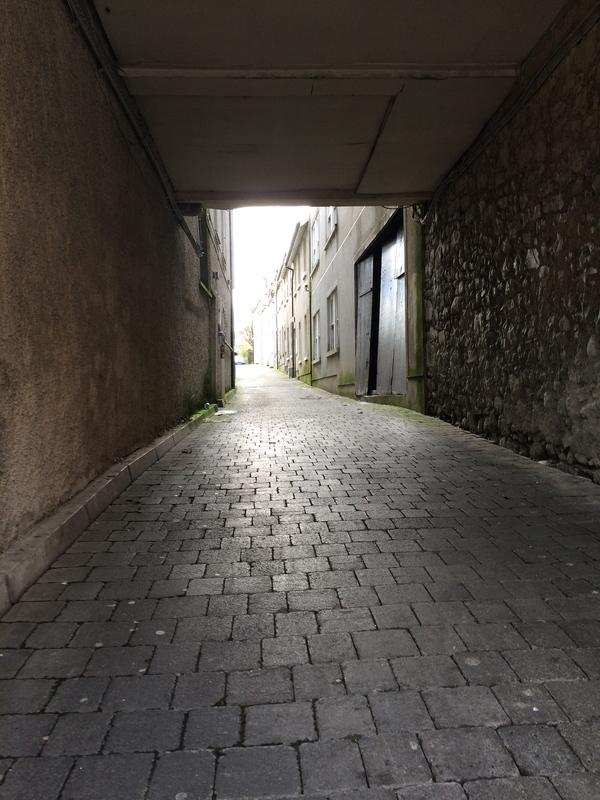 Back to the streets of Kilkenny city. The medieval streetplan is clear. Here you can see some of the alleys. and below: one of the tiny steep medieval lanes leading down to the river, used by old market stall traders, called “Slips” This one was traditionally used for butter, so is called the Butter Slip. Below: a really terrible picture, (sorry!) but of a very interesting house. Now a well-known local pub, this was once the home of a woman called Alice Kyteler, target of the most famous trial for witchcraft in medieval Ireland. She herself was extremely well-conected and rich, both coming from a wealthy family herself, and also having put four well-off husbands in the ground. She then became the focus of suspicion and then outright hatred for a fanatical bishop called Ledrede. It’s a long complex tale, because Alice herself had friends in powerful places, and at one stage Ledrede himself was imprisoned. But after a highly political few years, in 1324 Alice she was eventually brought to trial and then convicted for witchcraft. Being rich, she managed to bribe her way out of prison, at the last minute, just prior to execution. She then escaped Ireland, never to return. One of her maids, who’d been convicted alongside her, Petronilla, was not so fortunate. She died a horrific death, burnt alive at the stake. Below: the Thosel. 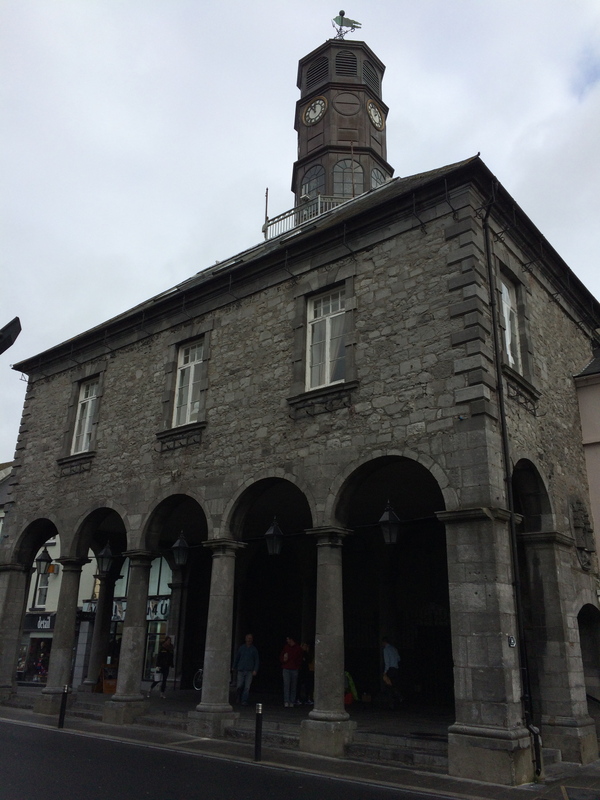 the city hall, where the tolls which were collected- as Kilkenny was a walled city- at the various city old gates, were gathered together here centrally. Hence “Toll-House” = Thosel. Dublin of course also had a Thosel but it was destroyed over 200 years ago. 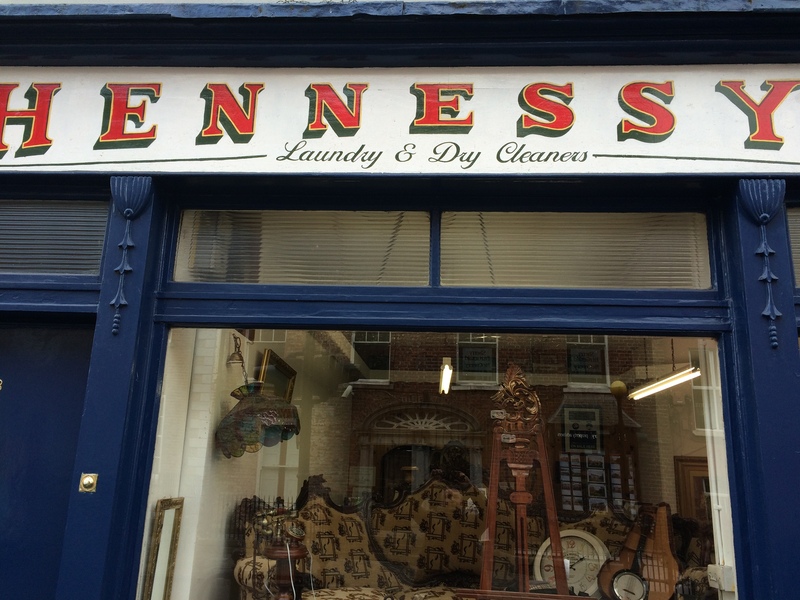 Drogheda’s Thosel, like Kilkenny’s, is still intact. 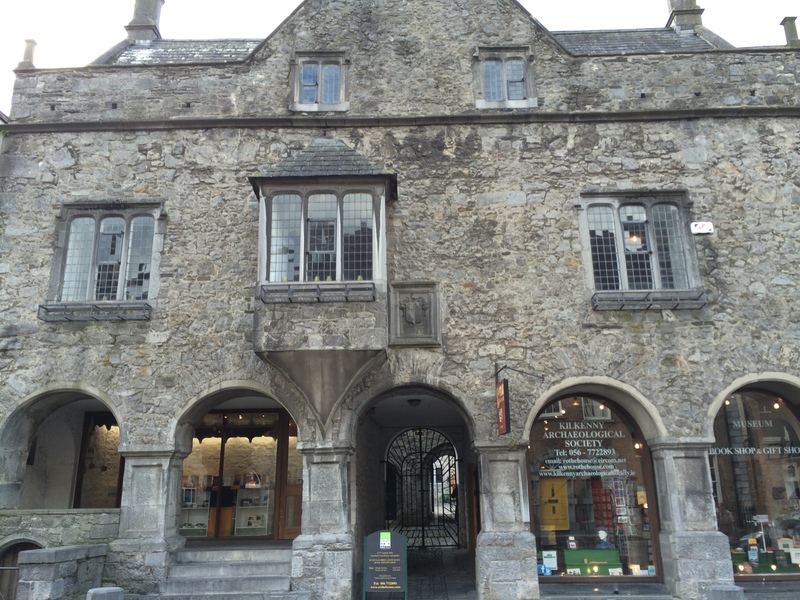 KIlkenny’s Thosel as you see boasts this fantastic medieval arcade of arches, not unlike something you’d see in Italy or Germany. 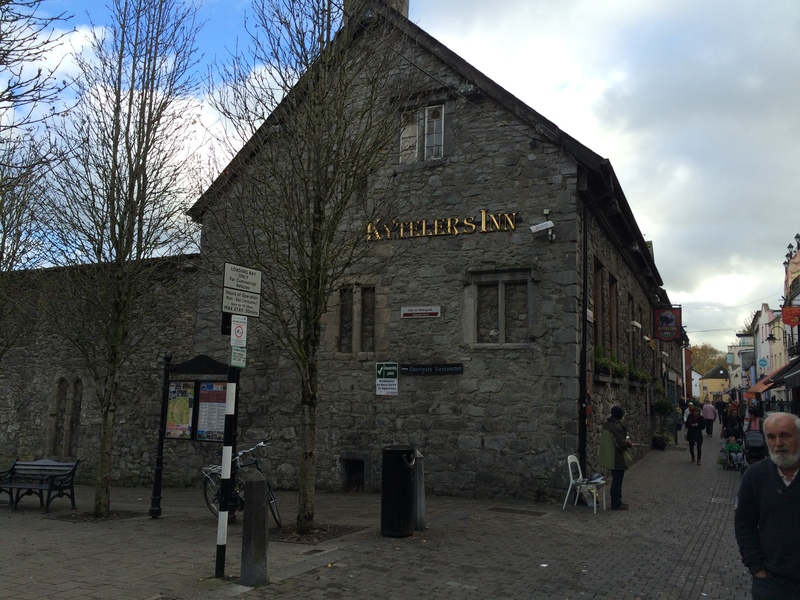 For what is by modern standards quite a small city, Kilkenny has lots to savour and enjoy. I was very taken with some of the traditional shop fronts for example, both town and rural/traditional “vernacular” – style. My guide pat told me from the 1980’s onwards they have the subject of a preservation partnership, between the city council and local businesses. Would to God we could manage the same thing in Dublin. 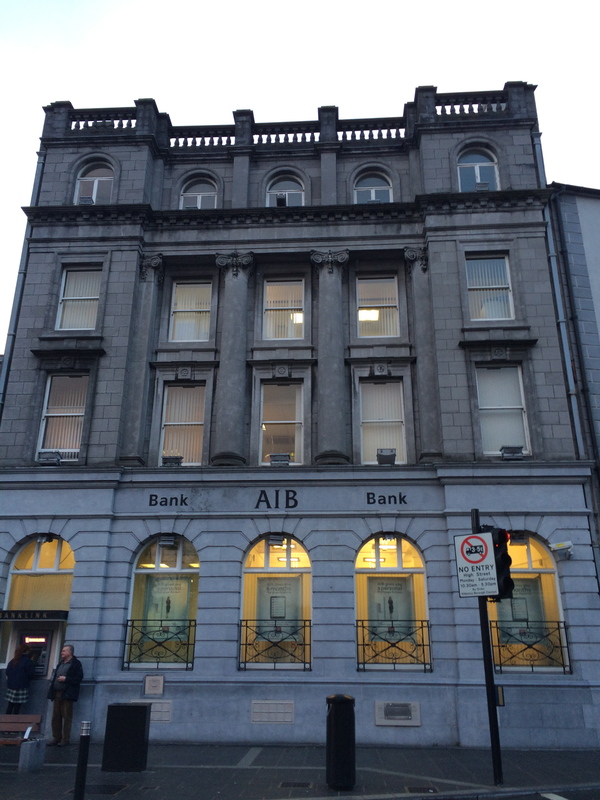 Some of the 19th century architecture is also very good, like this fine Victorian bank building below. Ditto houses from the earlier Georgian period. 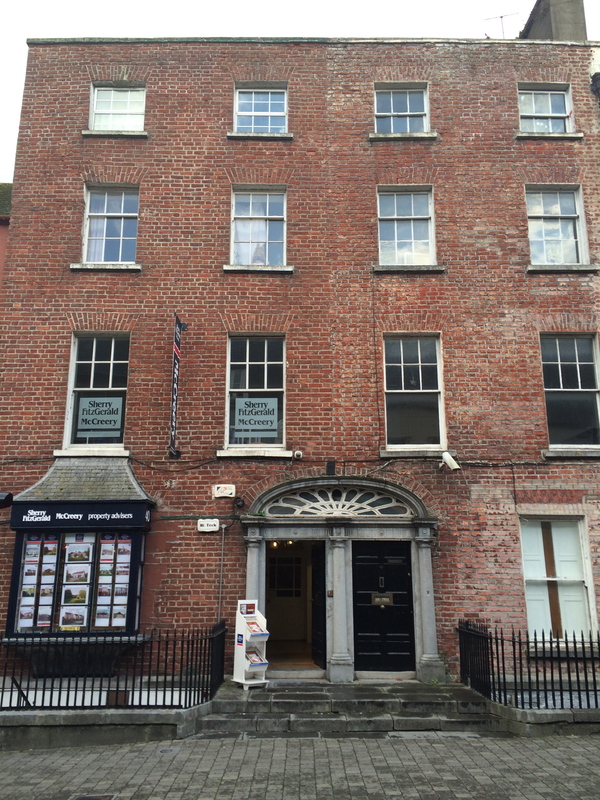 As you can see below, unlike in Dublin, the Kilkenny style of 18th century Georgian townhouse has two doors paired together, under a single fan-light, meaning a large lovely, slightly flatter “half-moon on its side”-style of fanlight. I also loved this beautiful old Carnigie library, built overlooking the river. As you can proabaly tell, I was quite smitten by Kilkenny! I could happily go on all day about it! I’ve barely mentioned the giant Kilkenny Butler Castle here, which would merit a post all of its own, if that is I felt qualified to talk about it, (which i don’t) But I’m going to leave it there instead. I’ve posted a few of my sources, links and references below for those who’d like to read more or even pay a visit. Huge thanks to the staff at the Rothe House and to my superb expert guide Pat Tynan. 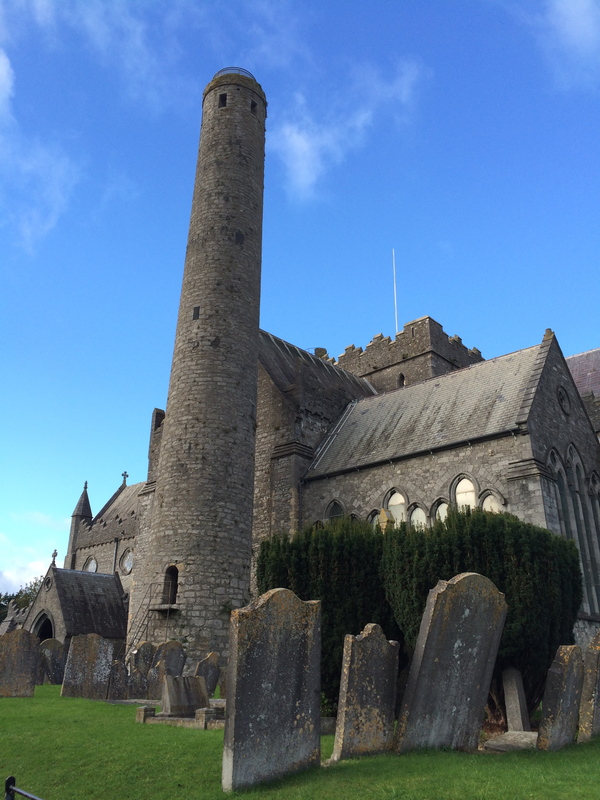 I leave you with a picture of the steep approach leading up to Kilkenny’s ultimate gem, St Canice’s Cathedral. Wait until you see what is inside! I’m hoping show you in my next post. But until then… thank you for reading. – Arran. A lovely taster, or perhaps sampler, Arran, though I’d like to know the size of those Kilkenny postcards! Really enjoyed your postcards from Kilkenny Arran. Looks like you had a gorgeous day for it with all those bright blue skies. Look forward to reading more. Looks like my kind of a place. 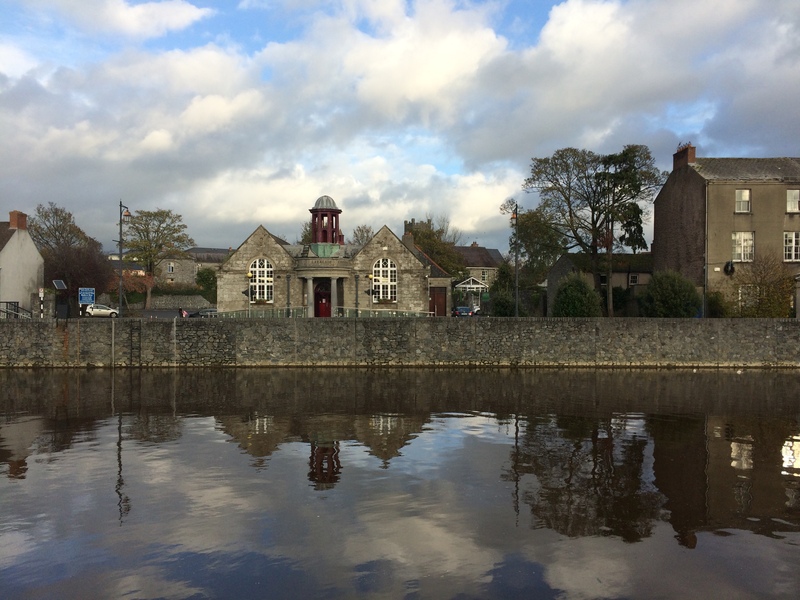 I was talking to a man from Kilkenny not long ago who said I really ought to visit—it has a very upmarket image now. The only thing I knew about it was the cats! One of the things that rather depressed me about small Irish towns is how bleak many of them are. So much tat was built in the sixties and seventies I suppose it was, and so little regard for the ancient monuments that litter the place. I was horrified when I heard about the motorway ploughing through some of the unexcavated bits of Tara. Criminal. I. quite literally, could not agree with you more Jane. Some of the mess and tat is quite breathtaking. Kilkenny was a refreshing tonic in that whole (sorry) regard. 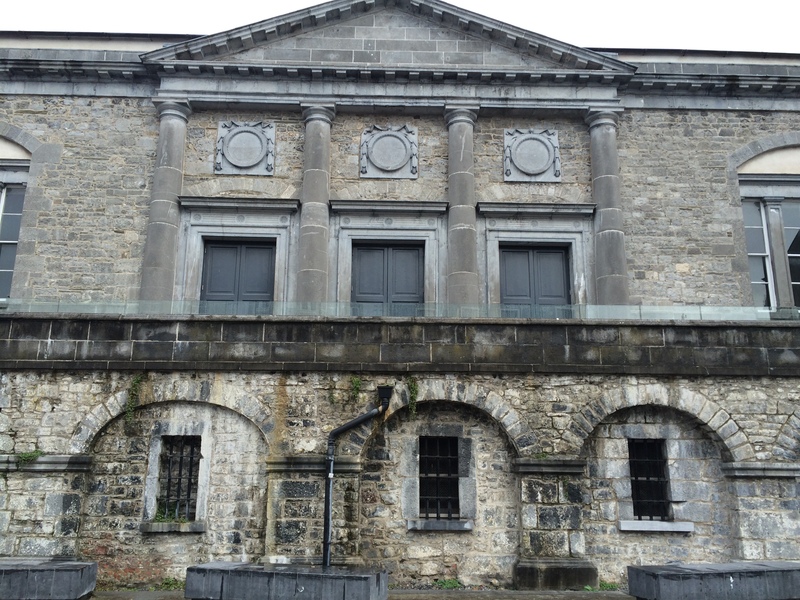 Next Post Tour through Liberties to Dean Swift’s historic St Patricks Mental Hospital | April/May date tba.